Combining large sets of complex data with a great user experience can be a huge challenge. If your organisation generates data for customers or the community, you probably want to share it. If you’re in government, you may be required by law to provide access. It makes sense to connect with your audience using information they understand. Unfortunately, data often starts its journey in a raw form that can only be interpreted by a data analyst. There’s no shortcut to this first step. You need to understand how the data fits together and what needs to be presented and prioritised. It’s essential that you get input from your in-house experts. 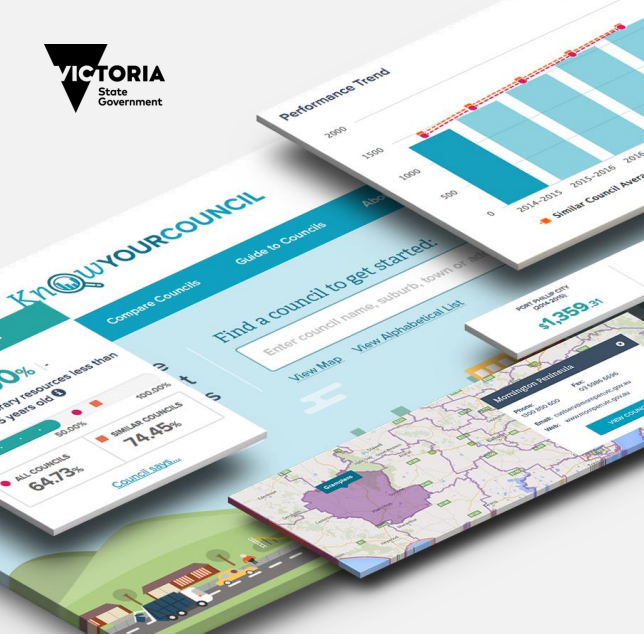 Working with Local Government Victoria (LGV) for their Know Your Council website we started with raw data and worked collaboratively with stakeholders and local council representatives to understand exactly what the information meant — to them, their customers and stakeholders. 2. Graph, Chart, Or Diagram? Developing a consistent visual approach that makes sense to the audience and maintains the integrity of the original data can be challenging. The visual approach must take into account measurements, data ranges and time periods so you can develop a meaningful representation. Sometimes you need to present a combination of data sets from different sources. Comparisons between data sets or presentation of data over time instantly make the data more meaningful to users. The choice of chart really boils down to the data and the purpose. For example, if your aim is comparison, radial charts may look interesting but they won’t work with values that scale above 100%, where a simple bar chart with markers for comparison will work better. Be prepared for a combination of workshops, consultation and testing before you get it right. Having multiple touch points means you’ll have a greater understanding of what the data means and it will give you insight into the best way to connect with your target audience. The Know Your Council data pages went through multiple iterations. With each version our understanding of the data and how to make it accessible deepened. Whether you are meeting mandatory requirements or simply wanting to do a better job of presenting data, make sure your design reflects the brand and philosophy of the organisation. For a friendly, open and accessible website such as Know Your Council, a number of approaches were presented and then tested. The final result, with illustration-style imagery and a friendly, welcoming palette aligned with the organisations broader communication goals. It also tested extremely well with the target audience and has been implemented on the site. The large data set behind the Know Your Council website includes complex data from 79 councils. This data is constantly evolving which each reporting period. Clear and easy to understand data ensures visitors to the site can easily understand the information and can compare and benchmark council data. By adopting this four tiered approach, Ladoo was able to successfully deliver a site that provides an engaging user experience and also meet mandatory government requirements. Contact Ladoo to find out more about our services.